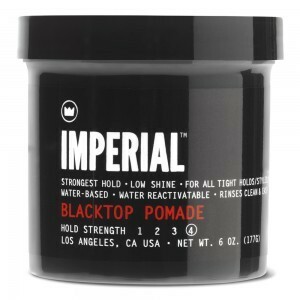 Favorite Imperial product: The Blacktop Pomade, because it’s the first of its kind and covers up to 60% of grey hair. It’s simple, but this and the other products can give men the confidence they need to be the best versions of themselves. And that’s what Imperial is all about. Behind Imperial Barber Products and the high-quality pomades, oils, and other staples of men’s grooming that they have created, stand two men: Pedro Zermeno and Scott Serrata. A barber to his core, Pedro couldn’t tell you about the best haircut he’s ever received from another barber because he’s been cutting his own hair for so long. 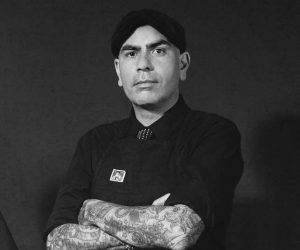 For him the adage is basically gospel: “If you want it done right, do it yourself.” That mindset is what lead him and business partner Scott Serrata (his story coming soon) to design their first Imperial product: the Classic Pomade. When the pomades that were available at the time kept missing the mark, they went out and did it themselves. Pedro has the well-deserved and hard-earned reputation as a master barber, a fanatic for perfection, and having a mind of his own. He began his journey by simply doing what the did best: cutting hair. Sounds simple, but his pursuit of excellence has lead him to becoming a professional barber, owning both a barber shop in Long Beach called Razorbacks and a men’s grooming line with his business partner Scott. The design and production of the premium line of men’s grooming products that Imperial has created is the stuff of lore. What is less well known to the world is the side of Pedro that likes to wear mismatched socks and loved the John Hughes classic movie “Sixteen Candles” in high school. This is a man who sees himself continuing to develop the best products possible for the needs of men’s grooming and lifestyle everywhere, including the dream of someday inventing a product that regrows hair for all his fellow bald men out there. If you look past the strong posture and steady gaze, Pedro is a man who starts every day quickly with a hot cup of coffee and his signature Hermes cologne. He’s risen above the time he accidentally gave an important client a big bald spot when the guard fell off his clippers, and he’s learned that attention to detail and a refusal to settle for less than the best are keys to his success.